For the left panel, see W.34-1912. The two panels are framed together in a 20th century museum frame; W.34-1912 on the left, W.35-1912 on the right. Originally these panels probably formed part of a reredos representing the Nine Choirs of Angels. The panels for W.35-1912 represent Powers (top panel) and Thrones (bottom panel). Painted in black on a gold background, at the bottom of the lower right panel depicting the Thrones. This inscription is now illegible. Possible that 'troni' is part of the word 'patroni' meaning patron. Two of four panels, probably from reredos representing the Nine Choirs of Angels. 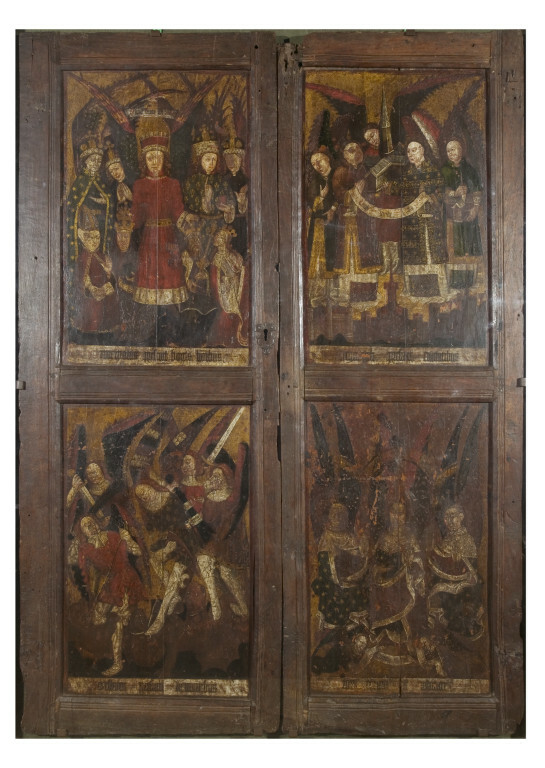 The four panels are framed as a pair of doors, probably in the late Sixteenth Century. Purchased, 1912. Said to have come from a Northamptonshire church. 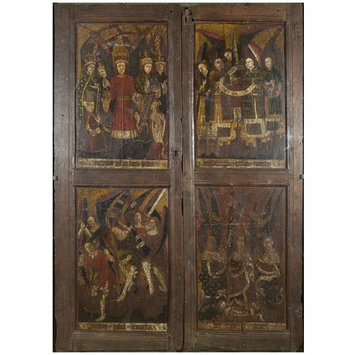 Historical significance: These panels are one of a considerable number of examples of 15th century English paintings on panels to have survived, most of which are of a rather humble and craftsman-like quality. The object consists of two panels. The lower right-hand panel depicts the Thrones. Three winged figures seated in robes decorated with stars, with white capes and hoods, and in the attitude of giving judgement. Each raising a hand; at their feet are two smaller figures bearing an inscribed scroll. The upper right-hand panel depicts the Powers. Five winged figures, in armour and surcoats, trampling on and binding winged demons. One unsheathes a sword, next two are pulling the rope, a fourth holds a scourge like a black broom and a fifth is about to strike with a sword. Their armour is white; over it they wear dark-coloured surcoats. One holds a scroll. The idea that there are several classes of angels arose partly from the various functions assigned them in the Bible, partly from the names given to them by St Paul- Ephesians 1:21, Colossians 1:16. Angels were also arranged into hierarchies by Dionysius the Pseudo-Areopagite, in his Celestial Hierarchy of ca.1500, which translated into Latin in 9th century, became the standard text. More examples of paintings on panels, of this period, survive in reasonably good condition than any others. Typically well preserved examples of 15th century painting include Friskney, Lincolnshire and Pickering, Yorkshire. Most of the surviving pictures of this style are commonly found in East Anglia, particularly Norfolk. Symbolism of earlier centuries tends to be abandoned in the 15th century panels, for a genre and narrative treatment. Local and little known saints, both English and foreign become more common, a means of satisfying the tastes of the trading community. A reredos (also spelt raredos) is a screen or decoration behind the altar in a church, usually depicting religious iconography or images. It is a visually immovable appendage to the altar, which is holds neither liturgical significance or necessary importance in its position behind the altar. The reredos can be made of stone, wood, metal, ivory or a combination of materials. The images depicted on the reredos may be painted, carved, gilded, composed of mosaics, and/or embedded with niches for statues. Sometimes a tapestry is used, or fabrics such as silk or velvet. The reredos developed slowly from paintings on the wall against which the altar was placed, to carved or painted panels, of which these panels are an example, which were then fixed in place behind the altar. They developed slowly from paintings on the wall against which the altar was placed, to carved or painted panels, of which these panels are an example, which were then fixed in place behind the altar. 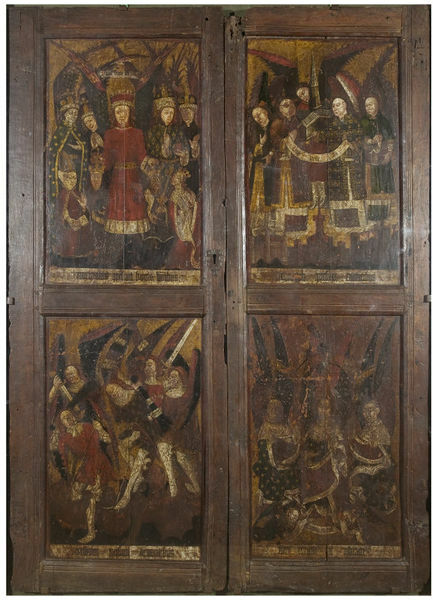 Tempera on oak, right panel of two forming a pair of doors, representing Powers (top panel of right) and Thrones (bottom panel of right). Anon British, 15th century. Framework probably late 16th or early 17th century.